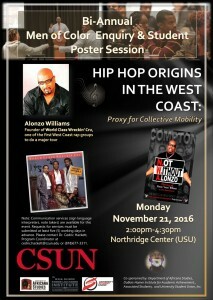 Hoping to inspire an introspective and external exploration of the influences, including hip-hop, on the lives of men of color, California State University, Northridge is hosting its fall Bi-Annual Men of Color Enquiry and Student Poster Session on Monday, Nov. 21. The session is centered around the origins of hip-hop on the West Coast and the role the music genre plays as a proxy for collective mobility for men of color. The event will feature a presentation by Alonzo Williams, founder of World Class Wreckin’ Cru, one of the first West Coast-based rap groups to do a major tour. The Men of Color event is scheduled to take place from 2 to 4:30 p.m. in the Northridge Center of the University Student Union, on the east side of the campus located at 18111 Nordhoff St. in Northridge. Hackett pointed out that the evolution of hip-hop provided its artists and fans an opportunity to confront stereotypes and to take on social justice issues, such as police brutality to the reduction of the black male body as a commodity, hyper-masculinity, and issues of identity and class. The music genre also opened doors to new avenues for entrepreneurship and education. The event will feature poster presentations by students about what they learned as they explored the issues raised by the rise of hip-hop and how it affected their lives or the lives of those around them. For more information about the Men of Color session, visit the website at http://www.csun.edu/dubois-hamer-institute-for-academic-achievement/events/bi-annual-men-color-enquiry-student-poster.